Robbie Lawler and Johny Hendricks went at it once again, this time under the Vegas lights in the Mandalay Bay Events Center. Once again it was close, once again it was thrilling, but this time one thing was different—Robbie Lawler was the one who walked with the Gold following a split decision victory. In a bumper card that delivered from start to finish, Sergio Pettis retained his Lightweight strap in stunning fashion by submitting Gilbert Melendez, while two heavyweight fights made sure the judges had a break. Here is all the action in it's entirety, for every single fight including prelims and the main card along with some capsules of analysis and commentary, along with suggestions for what's next following each fight. This fight was a war! Collard did well for the most part, but looked a bit sloppy at times. The kid was tough as hell and was able to pull off the decision. He is a very tough kid, but doesn't necessarily move up the ranks that much. He should probably fight a UFC newcomer next. Hobar rocked Pettis early and controlled most of the 1st round, but the holes in Hobar's striking game were exposed. I have to give it up for Hobar's chin though, he tooked a boatload of punches and kicks. 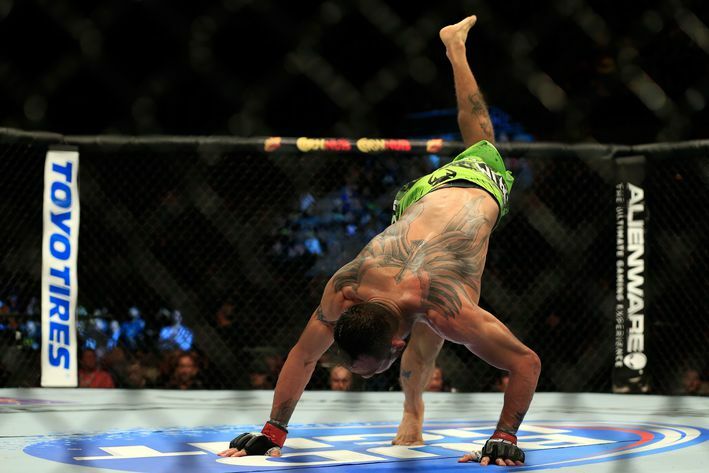 As for Pettis, I dont think he is anything like his brother but he is still young and improving. He hinted at a drop to 125 after, maybe a fight with the winner of Ray Borg and Chris Kelades could test Pettis even more. Evans-Smith started of really good by getting some good takedowns rather easily. Evans-Smith was in control of the fight but made a minor mistake and she paid for it. Pennington sunk in a bulldog choke and chocked her out cold. Evans-Smith has a bright future ahead of her, and Pennington should be proud of herself for capitalizing on her opponent's mistake. Maybe she can actually throw down with newcomer Holly Holm next like she was originally supposed to do. Corey Anderson dominated this fight from start to finish. Anderson,for the mostpart, held him against the cage and beat him up in a pretty boring fight. Jones did not look to bad on the feet, and landed some punches on Anderson. Anderson is still improving, but he still has a lot to work on. Maybe a fight with Gian Villante or Jan Blachowicz makes sense next. Gordon's brutal strength was on display early, as he was rag-dolling Samman around. Gordon seemed to be getting tired and looking to stall on the ground. As Gordon was getting tired, Samman goes up and lands a massive head kick putting Gordon's lights out! A great win for Samman as he comes back off a long layoff. Maybe a fight with Robert Whittaker or Caio Maghales makes sense for Samman next. I was really mad about how this fight turned out. Fransisco looked great in the 1st round by stuffing all of Faber's takedowns and landing some decent punches. 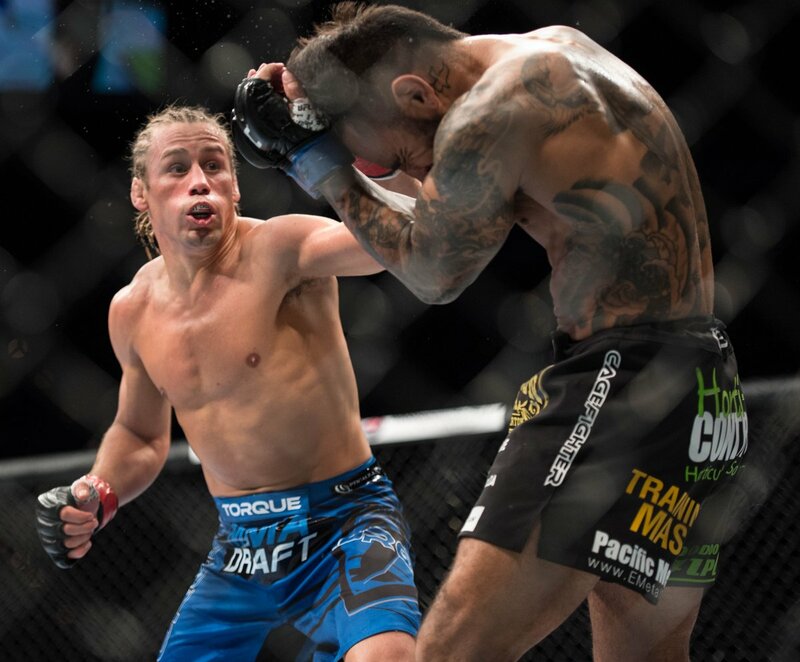 A Faber eyepoke led to a bulldog choke of Rivera, but in all honesty Yamasaki screwed up and didnt realize the eyepoke. I think Cisco's stock rises, but I really hope there is a rematch. This fight played out exactly the way I thought it would. Trujillo came out guns blazing and rocked Ferguson a couple times in the 1st. I knew Trujillo would gas out and Ferguson would capitalize. Ferguson sunk in a RNC choke and continued his win streak. Ferguson needs a step up in competition. I think a fight with Masvidal, winner of Parke/Tibau, winner of Iaquinta/Lauzon or maybe even Jim Miller make sense for Ferguson next. This fight was too easy for Duffee. Hamilton virtually had no chance against Duffee. Duffee landed a clean right that rocked him and another one to finish him off. Hopefully Duffee can stay healthy. Maybe a fight with the Alexey Olinykyk or Soa Paleli makes sense for Duffee. Travis Browne was the better fighter and it showed tonight. Schaub was expecting to take him down and grind Browne out, but that was not the case. Browne was ble to get up and hurt Schaub with a right uppercut. From there it was all Browne as he finished Schaub from back mount with punches and made Schaub quit. #UFC181 facts: @travisbrowneMMA ties Arlovski, Nelson, and Velasquez for most first round knockouts in UFC heavyweight history with six. This win puts Browne right back on track. Browne is in a weird position at HW though, hes fought a lot of the contenders already. The only logical fight I could see for him is Ben Rothwell or Todd Duffee. Gilbert looked great in the 1st round and utilized his gameplan perfectly. He pushed Pettis back against the fence and landed some decent punches. Pettis could never really get off in the 1st. The same continued in the 2nd, but Gil missed a takedown and was hesitant for a second and Pettis snapped on a quick guillotine and Melendez tapped. I don't know what is next for Pettis at 55. It has to be either Khabib or RDA. I would think the UFC would give Khabib a tuneup fight before giving him a title shot which would make RDA the front runner with a win over Nate Diaz. This was a dominating performance by Hendricks. Hendricks pressed Lawler in the 1st round and got his arms tired. Lawler did a decent job in the 1st with defending takedowns, but Hendricks got one towards the end of the round. Hendricks did more of the same by landing takedowns and putting on a leg kick clinic from rounds 2-5. Lawler gassed out pretty early, and Hendricks pushed him agianst the fence. Lawler wins a very controversial split decision that will be debated for a time to come. I guess Rory Mcdonald will have to wait for his shot because I think we have a trilogy on our hands. A new Welterweight Champion emerges, while Anthony Pettis is on a course to prove he's the World's best. But now, as we look forth to the new Chapters, and since The Time is Now, is it time for to complete the Hendricks/Lawler trilogy? A thrilling UFC 181 sees Robbie Lawler capture Welterweight Gold and Anthony Pettis retain his Lightweight title in Las Vegas.